Measured diagonally from corner to corner we have TVs ranging from 16” all the way up to a massive 85”. TV’s these days are packed with features. Browse our TVs with 4K UHD resollution for the ultimate detailed picture, take a look at our range of Smart TVs featuring apps for all the latest streaming & catch-up services such as Netflix, BBC iPlayer, Youtube and more. Choose the perfect television from our wide range of TVs. All major brands stocked including Samsung, Sony, Panasonic and many more. 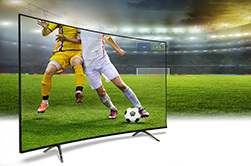 Our range of HD and 4K televisions deliver high picture resolution giving you the ultimate viewing experience when watching your favourite sports and movies or when playing games on a console. We have TVs of all sizes - ones that fit in large spaces to small living rooms. Select from LCD to OLED TVs in our range. OLED TVs offer high contrast ratio and are able to handle fast moving action such as sport games. LED TVs work well within brightly-lit rooms, are lightweight and ideal for being mounted on the wall. At Box.co.uk, we give you all the information you need to make best choice possible when choosing your television. Use our product refiner on the left to narrow your choice of TV by type, size or brand. 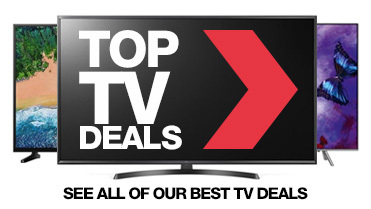 Or take a look at our best TV Deals here. Be it screen size, panel type, Smart features or resolution, we explain all! Probably the first question that you will find yourself asking is just how big should my TV be? To answer this, you will firstly need to consider the size of your room, how far from the set you will be sitting, and the type of viewing experience that you are looking for. Modern, sleek and stylish designs allow the bezel (the frame that wraps around the edge of your screen) to be thinner than ever before, meaning a larger viewing area. For instance, a modern 49” or 50” screen will take up roughly the same size as 42” TV will have done ten years ago! For optimum viewing, the distance between your set and where you sit should be around 1.5 times the size of your screen. An example of this would be taking a 50” TV (measured from corner to corner) and sitting at a distance of 6.25 feet (75”) for the best results. An ideal size for bedrooms, kitchens and casual viewing areas, with 32” TVs being the most popular choice. Versatile screens, perfect for small (40” and 43” screens) to mid-sized (49” TVs) living rooms and many bedrooms. Substantial sets, usually with 55” or 65” displays, that sit well within average-sized living rooms and larger bedrooms. Outstanding TVs for those that have a little bit more space for a flagship 75” television or if you are looking for the complete immersive viewing experience. Screen resolution and processing rates are the key factors consider when looking at your next TV purchase. Resolution – This depicts how many pixels a screen is made up of. 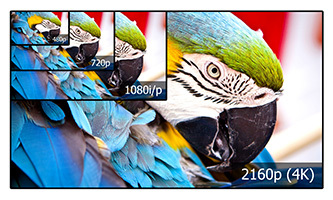 Generally, the higher the number of pixels, the more detailed an image will appear. 4K Ultra HD or UHD as it can be known, offers the newest and currently best resolution in the marketplace. 4K delivers up to four times the resolution of 1080p TVs and produce stunningly clear, detailed images. Over 8 million pixels (3840p horizontally x 2160p vertically) create a fully immersive viewing experience, with the added ability to upscale current high definition content to make what you already watch look even sharper. Full HD 1080p or FHD is currently by far the most common HDTV resolution available. Over 2 million pixels (1920p horizontally x 1080p vertically) allow you to watch Full HD content, TV programming and Blu-ray movies at their highest level of detail. 720p HD and HD ready TVs provide quality HD pictures for TV shows and DVD films at often affordable prices. Processing rate – How fast a TV processes screen changes. Typically measured in hertz (Hz), the higher the processing rate, the smoother the picture on screen will appear. Native refresh rates such as 120Hz or 60Hz will help determine the quality and performance for your picture. In essence, a TV with a 120HZ native refresh rate will completely rebuild its picture 120 times in one second. The more frequent a screen is refreshed, the smoother the images will appear to the viewer. Other proprietary technologies are developed by manufacturers help to enhance faster moving images by creating smoother, seamless pictures. Examples of this would be Samsung’s Motion Rate technology, LG’s TruMotion feature or Sharp’s Active motion to name but a few. All of the above work in tandem to produce a fluent picture with minimal blur, particularly when viewing fast-action scenes in movies, racing or sports. HDR (High Dynamic Range) produces brighter pictures that are more illuminated than that of a standard TV. With a wider range of colours, brighter whites and deeper, darker blacks, HDR TVs provide a picture that looks much closer to real life. The UHD Alliance, a consortium of TV manufacturers, technology firms, and film and TV studios, created the Ultra HD Premium label to define the set of standards for what TV manufacturers can call an HDR TV. In other words, if a TV has the Ultra HD Premium label then it will support HDR content. LED, OLED, QLED or Curved? LED (light-emitting diode) TVs are both the most popular and widely available TV type available on the market, producing exceptional picture quality and generally cheaper in price. OLED (organic light emitting diode) TVs offer greater levels of contrast and rich, vivid colours with wider viewing angles on generally thinner screens. Containing pixels that create their own light source, producing true blacks, with lower energy consumption than that of an LED. QLED (Quantum dot LED) Experience the next innovation in TV and see colour in a new light. Ground-breaking Quantum dot technology delivers Certified Ultra HD premium picture quality and the world’s first 100% Colour Volume. This displays flawless true-to-life colour, with the highest luminance levels and exceptionally true blacks. Curved TVs are modelled to imitate the way our eyes create peripheral vision. The science behind concave screens is to wrap around and fully immerse the viewer, reducing the amount of reflections and enhancing sense of depth. Connecting to your home internet network, or often other smart devices such as phones and tablets, Smart TVs allow you to browse applications and seamlessly stream content online or share from one device to another. 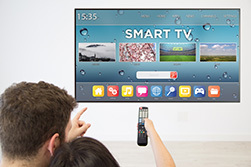 Smart TV homepages will vary from one manufacturer to another, with built in applications (apps) enabling you to access online content via your internet connection. These may include TV catch up services such as BBC iPlayer, movie streaming options from services like Netflix and Amazon Prime. Social networking apps such as Facebook or Twitter, You Tube for video sharing and much more. A selection of Smart TVs will also pair up with other devices, such as webcams for those that support Skype, or peripherals like Smart keyboards and remotes designed to enhance your online experience. Others will allow you to share content from your smartphone, tablets or laptops when connected via WiFi. The apps available and compatibility with other Smart devices will vary by the brand you buy. With the ever increasing demand for better picture quality and thinner screens, most TVs will now feature a simple stereo sound or ‘virtual’ surround sound effect. Pairing your TV up with a soundbar, soundstage or home cinema system will allow you to create an enhanced all round viewing experience. A Sound bar is a long bar shaped speaker that is traditionally placed either in front of the TV of fixed to the wall beneath. With varying options available with and without subwoofers, many have built-in wireless connectivity, eliminating those nuisance wire trails and allowing you in many cases to connect to compatible multi-room speaker systems. A sound stage or sound base system provides an all-in-one solution that generally sits underneath your TV and tends to come with subwoofer built-in. For a fully immersive, cinematic experience, look no further than a home cinema system with both front and rear speakers.